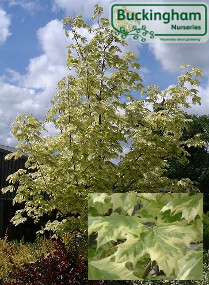 Pale green, deeply lobed leaves at the Garden Centre. 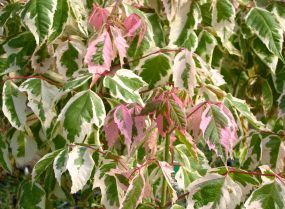 New leaves unfurl as salmon-pink, then change to pink-margined with a pale green centre, with the margin fading to white in summer. This item is no longer in our catalogue, but may be able to be ordered from our Garden Centre - contact our plants office for more details. 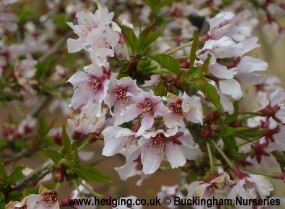 Semi-double pale pink flowers on Autumn Flowering Cherry. 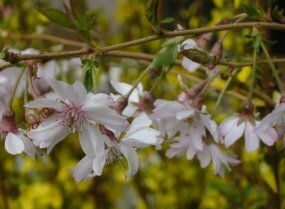 Dainty pale pink bell-like flowers in spring. Click on a picture for full plant information and prices. All pictures © Buckingham Nurseries and Garden Centre, all rights reserved.